When people step inside your business, it is important that its layout and design make a positive first impression. Outdated facilities could give potential customers or clients second thoughts about working with your company. 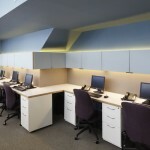 Additionally, the layout of your commercial space should also be conducive to a good working environment. Rather than having to work around your space, your space should work for you and help make all of your operations more efficient. Office space – If you have a standard office environment that is in need of a facelift, our team at Creative Renovations is pleased to be of assistance. We design bold new environments that allow for better intra-office communication and make people more likely to enjoy coming into work every day. Retail – Retail stores should have attractive designs that are easy to navigate for their customers. Let us take a look at your store and give you suggestions for how you can improve your design or layout. You may be surprised at how even a small renovation could drastically improve the shopping experience of your customers. Restaurant – If you own a restaurant and are looking to change up its interior or exterior design or need to do some remodeling, our team can help you to do so in a way that provides your customers with the best possible dining experience. Other – If your business falls into any other categories, our renovators are happy to discuss your needs with you. Contact us today for more information. Give your business the overhaul it needs to stay on the cutting edge. Contact Creative Renovations today at (718) 858-8900 or email us at info@creativeren.com to get started.